The Republic F-105 Thunderchief, also known as Thud, was initially developed to be a single-seat, nuclear-attack airplane. However, the need for aircraft capable of performing Suppression of Enemy Air Defenses (SEAD) missions against surface-to-air missile sites required the development of the two-seat Wild Weasel variant. Extensively used as primary strike bombers in the Vietnam War, the single-seat F-105D delivered heavy bomb loads against military targets. With a modern navigation system, improved cockpit displays, and an all-weather attack airframe, the Thud is capable of operating even during adverse weather. In addition to their missions for the Air National Guard, several F 105 Thunder chief D models were also seen in the Pacific and Southeast Asian theaters; some of them also carried out important roles during various operations including the Operation Rolling Thunder. 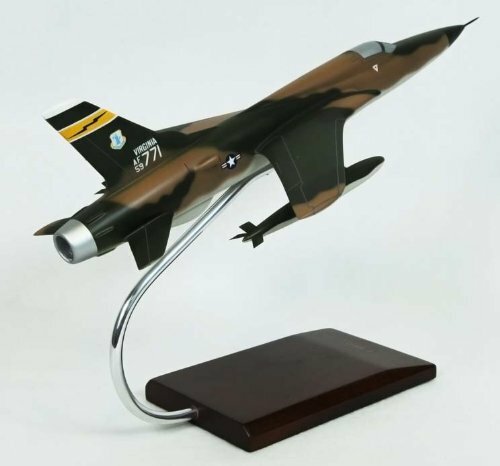 Though the remaining F-105Ds were last flown on February 25, 1984, you can pay tribute to these Thunderchief planes by getting this high-quality wood model aircraft. Remarkably detailed according to the schematics of the original plane, this desktop model airplane features carefully hand-painted insignia and panel lines for realism. Grab this replica today!